I like to respond to all the comments I get on my blog. A big part of the reason I started blogging was to make connections with like-minded people, and connecting through comments is a great way to do that. Therefore, it makes me sad when someone comments on my blog and is a no-reply blogger - it means I can't reply by email like I usually would. I worry that no-reply bloggers think I don't care about their comments - I do! So - here is a step by step tutorial to stop being a no-reply blogger! It's pretty simple, but I have to say, it took me a while to work it out when I first started blogging. Step 1. 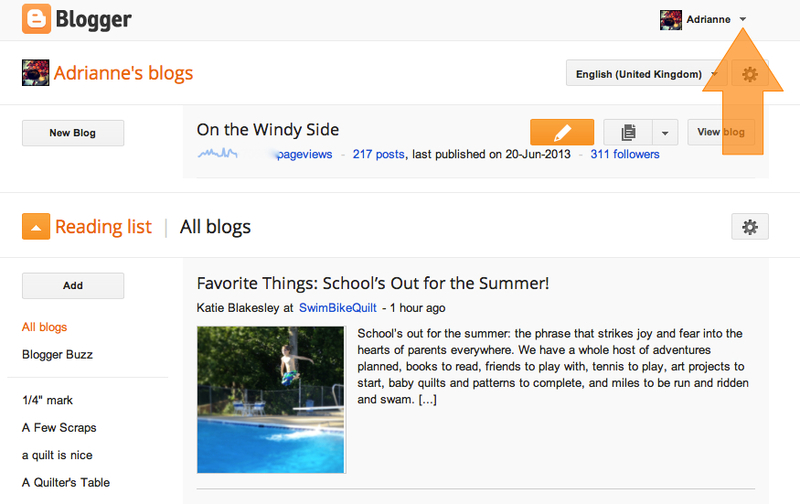 Go into your blogger dashboard, and click on the tiny arrow next to your display name (yup, where the big giant orange arrow is pointing). Step 2. 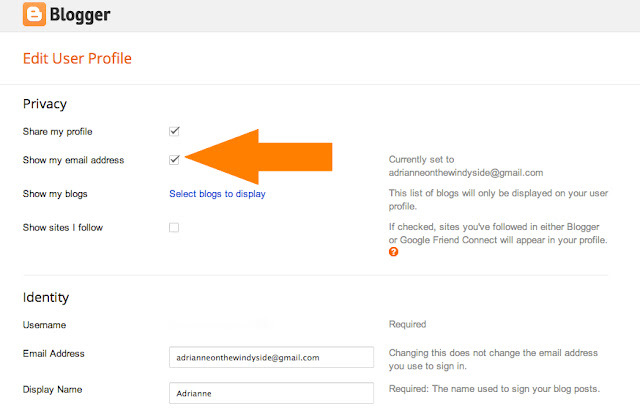 Click on the "Blogger profile" link in the box that appears after you click on the arrow referred to in step 1. Step 3. Click on the "Edit Profile" button. Step 4. Make sure the box next to "Show my email address" is checked. You can set up a special email address for your blog - you don't have to share your private email address if you don't want to. I really hope that was helpful! Let me know if you have any questions - and if you're not sure whether or not you are a no-reply blogger, please put your email address in your comment. Edit: if you are having trouble implementing these instructions, you might be a Google+ member, which automatically makes you a no-reply blogger. If so, click on this link for a tutorial on how to fix the Google+ no-reply blogger problem. Thanks to Heather for the heads up! Wordpress and other non-Blogger users: There is actually a way that you could have a blogger account which includes a link to your blog. It's true that you can only add Blogger blogs under the heading "my blogs", but if you enter your blog URL in the box that says "homepage URL", it shows up as "My Web Page" in your blogger profile. I know this might seem like a p.i.t.a., but you only have to do it once. Clearly written and explained. Being able to reply to comments certainly is helpful. Just saw news footage on the wild storm which has passed through NZ - hope your area is OK. This is a great post, just went in to check and I am a reply blogger! Hopefully I am no longer no-reply. This is a good post, but Heather is right. I have been using Google+ for about six months - since I started blogging. I have been through those steps to quit being a no reply blogger sooooo many times. And something to do with Google+ always reverts me back to a no reply blogger again, when I least expect it. Google trolls, I think! And when I first seen the title for your post, I thought you had figured out how to stop the madness. I am going to give up the Google+. Thanks for the post. It is good that people are still discussing it. Maybe one day Google+ will start listening and get rid of those nasty trolls! Ha, ha! Thanks for this Adrianne, I had no idea, but then I'm not very adventurous when it comes to clicking things. I'll just go and have a look now. So frustrating when someone ask you a question but they are a non-reply blogger! Great tutorial, will send the link to those people! I understand that. I like to keep in touch as well. Anyway there are also bloggers that reply to comments on their blog which I don't understand either. I'm not usually coming back to post I already read. Holy Poop! I had no idea about this.....I guess this explains why nobody ever answered my questions and my extreme lack of luck at giveaways?!? Thanks for these instructions. Thanks for posting this, I get so many comments from no-reply bloggers! I had been wondering about this myself. I am a wordpress user, and I had no idea about the no-reply blogger setting... Well, because wordpress doesn't have the same setup, which is kind of a bummer. I hate to sign up for one more thing with one more password I won't remember... Sigh. Cool idea to make a button. Although people could reply on my posts - I loved to see your little tutorial. There is always something new to be learned. Thank you! I didn't realize I was being a snob... until someone told me hahaha. It's all fixed now. 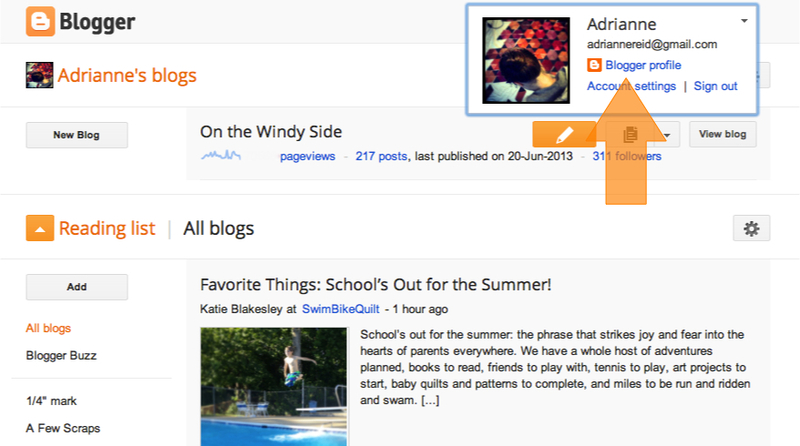 Hi Adrienne: I've been told that I always show as a no reply blogger on Word press blogs. 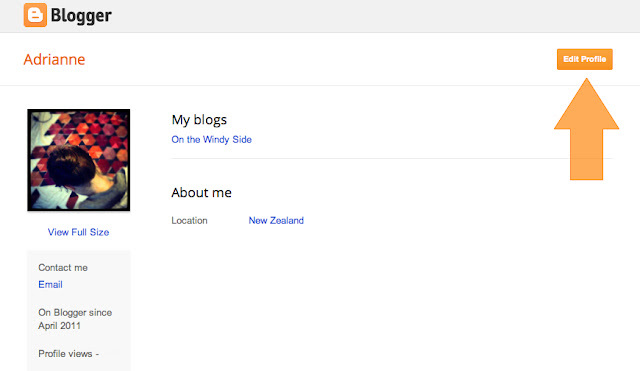 I'm on google plus and I'm thinking of switching to just being blogger but I'm not sure if this will fix the problem. I'm thinking of the switch because google plus switches me to no reply every couple of months. Also how do you get these little I'm not a robot buttons. When I go to my blogger page, I do not have my name on the upper right with the downward pointing triangle. I have the typical 9 little squares, a bell in a circle and a circular photograph. When I click on my circular photo, it lists my name, my google email address, clickable links that say "Google+ Profile" (so apparently I am a google plus user, how do I remove that? I don't need any more complications in my life!) and "Privacy" Then a blue rectangle with "My Account" that I can click on. That link open a new tab that says "Control, protect, and secure your account all in one place". Please help me find out if I am a no reply blogger and how to change my status if I'm not. I am hopelessly lost, but that is nothing new.